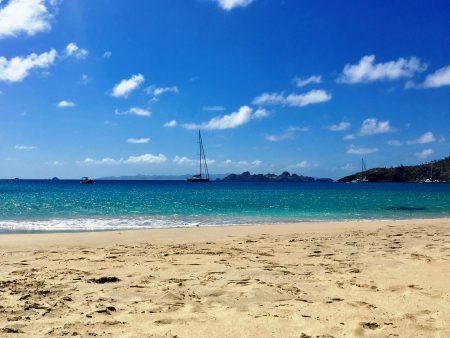 Many of our clients love St. Barth so much that they vacation on this tiny piece of paradise more than once a year. Today’s Guest Blog is written by Amy M. from Summit, New Jersey. 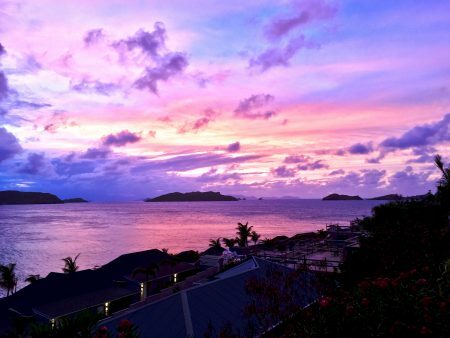 My love affair with St. Barth began almost 15 years ago with a special group of friends. The idea was a girls’ trip—no husbands, no children, just friendship in paradise. Every April for 10 years my friends and I returned to “our” island. We rented villas, enjoyed long sandy lunches, explored beaches, hiked, shopped, relaxed and laughed (a lot) until life and schedules got in the way. After 2 years away, I realized how much I missed St. Barth and decided it was finally time to introduce my husband to my “other” love. Just days into our first trip he was sold—he too loved the island’s winding roads, beaches, food, wine and of course, the warmth of its people. After a few trips together, we decided to bring our daughters for a Thanksgiving holiday. They immediately loved the island and asked on that first Thanksgiving if we were returning for the next one. Yes, of course, we all agreed, this would be our new tradition. The next Thanksgiving was last November, not long after Irma, and we were determined to keep our plans. Several plane changes and 1 villa later (thank you SBP!) we were fortunate to return. It was a very special trip, one I will always remember with a few tears—not only for what the island had endured, but also for its strength and warm embrace. 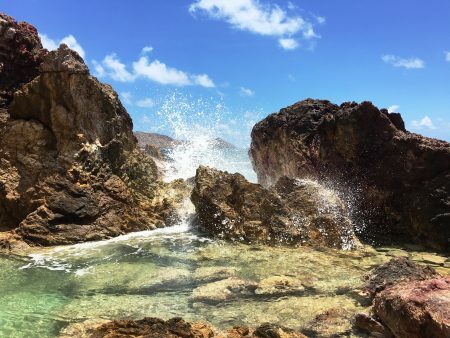 While St Barth had obviously suffered greatly, it was fighting back in full force and we were touched by its courage and spirit. We didn’t mind the scarcity of WIFI or no landline, we allowed extra time to drive the darkened roads at night and didn’t mind less choices for eating out. We spent a peaceful week amidst the quiet beauty of the island slowly greening, growing and rebuilding. It seemed especially fitting to end that trip with Thanksgiving dinner in the newly planted garden at Tamarin, beside the beautiful tree, celebrating and giving thanks. Shortly after returning home, we made plans for next Thanksgiving. Knowing I couldn’t wait that long, I had an idea. My husband’s birthday falls the last week of April, and truth be told, a few were missed over the years due to SBH trips. He never minded when the group calendar synched that way and always said “go, have fun with your friends” so I decided this was the year to finally celebrate his birthday, together, on St. Barth. 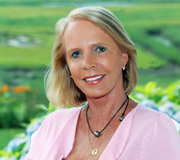 I got in touch with Julie Nally, my trusted SBP villa agent, and she arranged our week at Villa Birdy in Pt. Milou. I couldn’t wait to see how far the island had come since November and it did not disappoint! Travel through SXM was much improved—the new temporary air-conditioned tents are comfortable and the entire process more organized. I flew down a couple of days early as schedules allowed, but even separately, both JetBlue JFK-SXM flights were on time, and both St. Barth Commuter flights actually departed early. Smooth and efficient, I landed and was greeted warmly as always by Odile at Gumbs. On the drive to Pt. Milou I could see right away how much the island foliage had grown and how many palm trees had regrowth. There are still homes and roofs to repair, hotels to reopen, and work to be done, but the island felt much more like itself. I settled into the villa, perfect for the two of us, just above the Christopher hotel, and enjoyed the sunset. The sunsets at Villa Birdy were glorious. After a peaceful first morning at Gouverneur Beach, it was time to stock the villa. The Oasis market in Lorient hadn’t yet reopened in November but has since been nicely redone and is very convenient to the villa. Marché U was completely stocked, the freezer sections full and I found more than everything I needed. That night, I had the pleasure of meeting Julie for dinner (she happened to be on island for SBP business) at the wine bar Le Papillon Ivre in St Jean. Just up from Le Piment, it’s a sweet casual spot with wines by the glass, an extended menu of small plates and very friendly service. The food was delicious. The next day, after a walk around Pt. 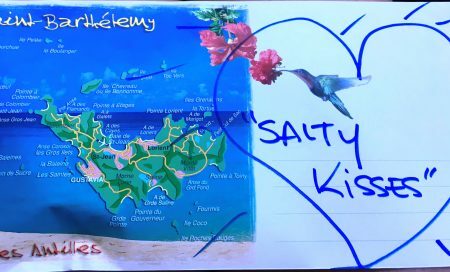 Milou, I spent a few hours on Saline Beach before picking up my husband at the airport. 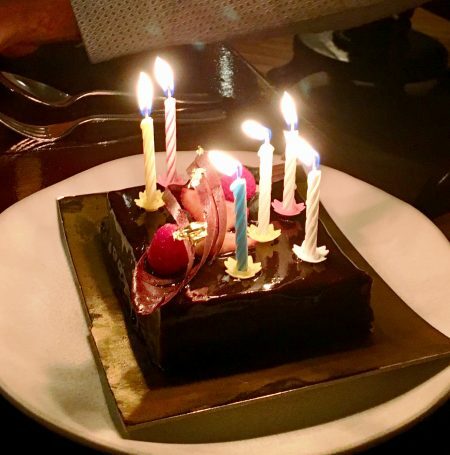 We toasted his birthday at sunset and headed to dinner at François Plantation located at the Villa Marie hotel, a perfect choice for a special occasion. The room is stunning, the service top notch, and the food outstanding. In conjunction with the restaurant, SBP arranged a small birthday cake for dessert, candles and all. Delicious! The birthday dessert at François Plantarion was fabulous. Over the next few days we explored our favorite beaches. Gouverneur again was sparkling, a bit windy with perfect waves. The tree at the entrance is slowly growing back and there was ongoing dune restoration with great progress over several days. The path to Saline looked greener, and while the descent down was significantly steeper in November, it now seemed slightly less so. 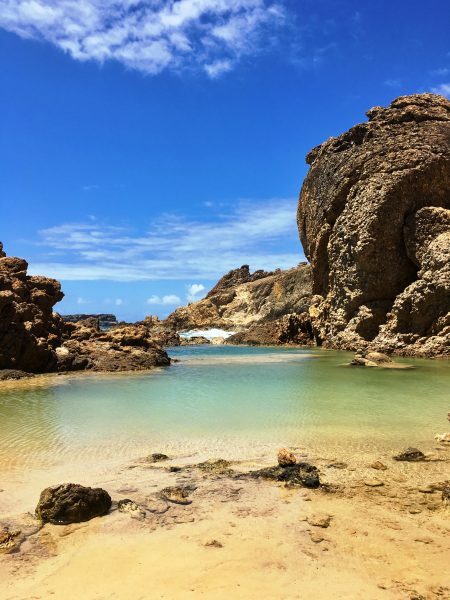 The lower hike to Colombier was as picturesque as ever and we finally found new access paths down to the beach after years of scaling the big rock. We noticed fewer rocks in the water and definitely less at the far end of the beach where many had accumulated post Irma. Several boats were docked, and, despite some wind, we found a nook and enjoyed a peaceful afternoon before hiking back and stopping at Shellona for drinks. It was fairly full at late afternoon and understand they have recently closed until June to expand their kitchen. 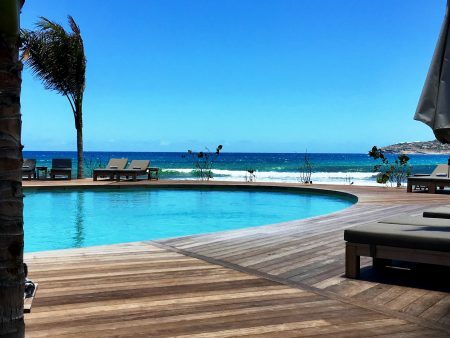 Earlier that day we stopped in to see the recently opened beautiful Hotel Manapany in Anse de Cayes. A very pretty spot on the beach for lunch, drinks or dinner. The main pool at the Manapany hotel is beachfront. Loved the feet in the sand restaurant at the Manapany hotel. That night we met Julie at the re-opened Bonito for sunset cocktails. Such a stunning room, very happy to report it is as beautiful as ever post Irma. We sat at the bar and enjoyed a perfect sunset over the harbor. St. Barth Properties Villa and Hotel Specialist Julie Nally took this picture of us when we met her for drinks at Bonito. Since we had a little time before dinner, we walked down to Baz Bar to see its re-do, always a special spot for drinks along the harbor. It looks very much the same, though miss the loungey feel of the original. We then walked up to L’Isoletta for delicious pizza, red wine and great service, perfect for a casual night. Another excellent dinner was Orega—one of our favorites. Everyone so friendly and welcoming with wonderful food, the tuna with foie gras a must. Greg, the owner, was as hospitable as ever, the restaurant beautiful. The next day we hiked to the natural pools at Grand Fond—something I’ve wanted to do for years. There are a few spots where you might not want to look down for too long (!) but it is a breathtaking hike and well worth the effort. We walked to the Natural Pools at Grand Fond. Another photo of the Natural Pools in Grand Fond. After a quick change we walked down to a gorgeous lunch at Mango at the Christopher hotel. While rebuilding Taïno restaurant, the hotel has done a great job managing the construction while keeping Mango and the hotel spa open. 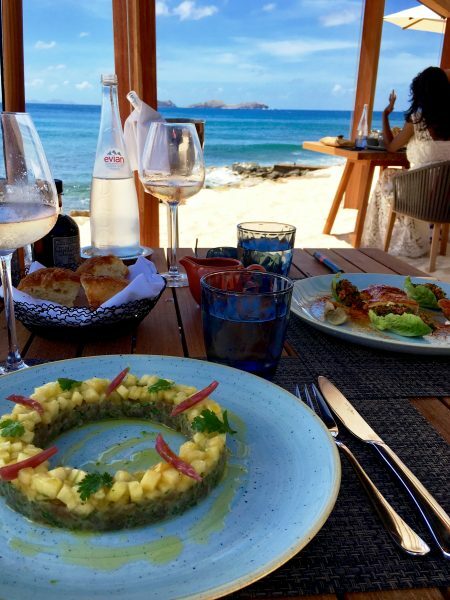 We enjoyed the seaside setting and some of the best food I’ve had on St Barth. The chicken gyoza, soft boiled egg in mushroom crust, crispy chicken leg with tabbouleh, and yellowfin tartar were all excellent. We spoke with one of the staff who said the pool is scheduled to reopen in June, fingers crossed! We enjoyed having lunch at the Christopher hotel’s feet in the sand Mango restaurant that is just a short walk from Villa Birdy. That afternoon it was time to shop. Most stores in St. Jean and Gustavia have reopened (with a few to come) and after a quick run to Kiwi, we drove into Gustavia to M’Bolo for our favorite vanilla rum. The bottles we bring home never last long, so fortunately Sandy and Christian have started selling online at mbolo-rum.com. We stopped at Bijoux de la Mer to pick up a repair which Marie sweetly sealed in an envelope for our daughter, then visited a few other favorites like Baya before drinks at Bar L’Oubli. 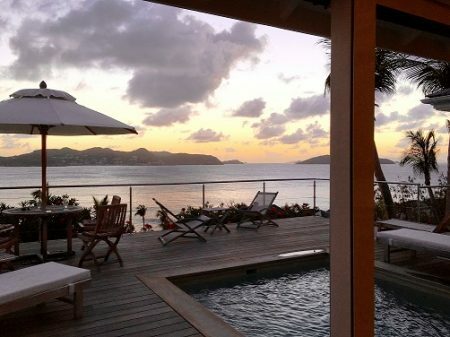 We restocked our wine supply at Le Cellier du Gouverneur and La Cave du Port-Franc on the way out of town and headed back to the villa for sunset, a casual dinner and a St. Barth full moon! Sweet packaging by Bijoux de la Mer. After service at the Anglican church Sunday morning, we drove up to the park by the hospital and took in the views before heading to Saline for our last afternoon. On the way back, we stopped at Eden Rock’s pop up on Lorient Beach for a glass of rose. It was very quiet that day, and we enjoyed seeing their temporary set up for lunch, drinks and lounging. We had a long chat with one of the staff who said the hotel plans to re-open just before Christmas. Later we walked down to meet a friend for cocktails and another gorgeous sunset at the Christopher. It was then on to dinner at Tamarin— the gardens as beautiful as ever. The restaurant was quite busy and the food, wine and service excellent. After dinner, back to the villa for vanilla rum and one last night of stargazing. The view from the park behind the hospital is breathtaking. Our last sunset from Villa Birdy was beautiful. All in all, my plan worked! A very special birthday celebration and a perfect trip—travel, weather, villa, restaurants, shops, hikes, people—all fabulous. 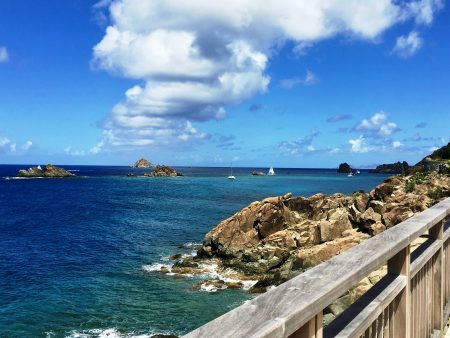 We are so fortunate to have been to St. Barth twice since Irma and very encouraged by, and in awe of, all that’s been accomplished. 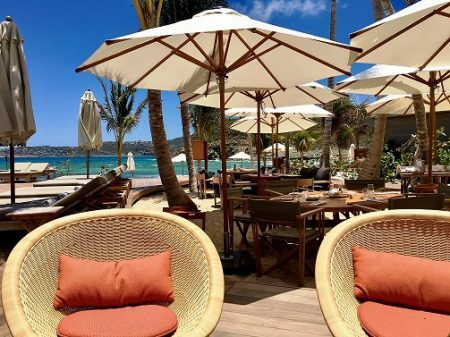 For those who know St Barth, do not hesitate to come back, you will find it as beautiful as ever and its spirit unchanged. For those considering a first trip, now is the time. In these months of rebuilding the island is quieter and more like its older self, while well on its way to becoming better than ever!